LOS ANGELES, CA--(Marketwire - November 26, 2008) - For the first time in her successful nine-year career, BoA, the 21-year-old Pop super-star from Asia, is set to debut her first American album in the first quarter of 2009. In preparation, BoA has hit the studio with some of music's top producers including Brian Kennedy, who has created hits for Rihanna, and Sean Garrett, who is behind #1 hits by artists including Beyonce, Fergie, Nelly, Chris Brown, Ciara and more. New York fans will be able to catch BoA performing live in the MTV studios on December 3rd between 11am and 12 noon. The performance will be shown on the largest high definition screen in the heart of Times Square. BoA will be performing on December 6th at the Honda Center in Anaheim for the KIIS FM Jingle Ball concert. Performing on the Village Stage, BoA goes on at 4pm during the pre show events. Other artists performing on the Village Stage include Tokio Hotel. 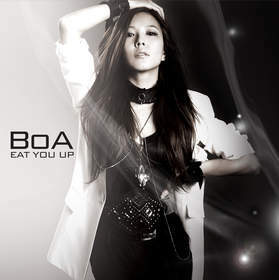 BoA's current single, "Eat You Up," has recently enjoyed a hot shot debut at #42 and has now climbed to #37 this week, after being #1 Breakouts Club Play on the Billboard Hot Dance Club Play chart. The single and album come on the heels of a career steeped in several international releases (Korea and Japan), multi-platinum sales (near 20 million records sold), prestigious awards and accolades (MTV Asia Most Influential Artist Award), and a number of international endorsements. The single reached #2 on the iTunes Dance Top Songs Chart. For additional information, press kits and interviews for BoA, contact Renee Charles at Green Honey Media at: press@greenhoneymedia.com.